thegracioushostessblog | The greatest WordPress.com site in all the land! 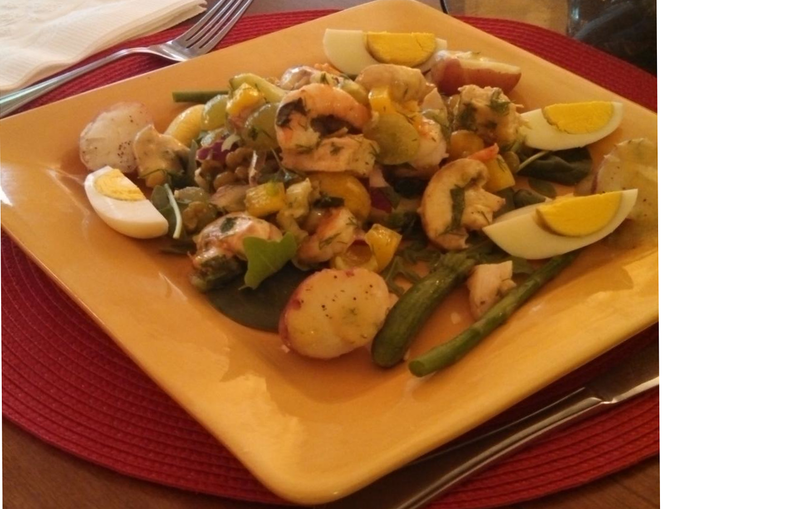 I am so excited about the new cooking class at The Crescent Club in Memphis. This is a “foodie’s delight!” The first class was January 10, 2017 and Chef Stan Gibson dazzled attendees with four fabulous dishes cooked tabletop in the bar in front of the fireplace. What better place to host a new cooking class? The cost is only $10 person and includes a glass of wine. 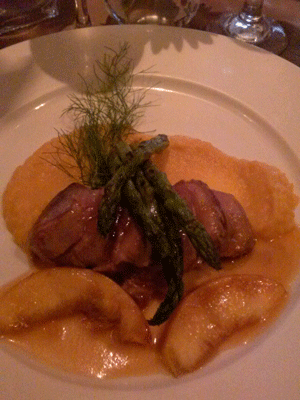 My favorite was the Pan Seared Sea Scallops with Mushroom Sherry Cream. 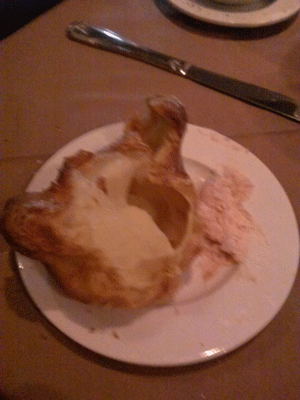 The last dish of the evening was one my youngest son would love as a Jack Daniel’s fan. It’s called, Pan Seared Pork Tenderloin Paillard with Jack Daniels BBQ Butter Sauce with White Beans. 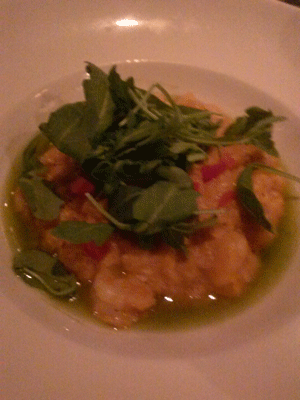 I would leave off the white beans as I am not a fan of them. 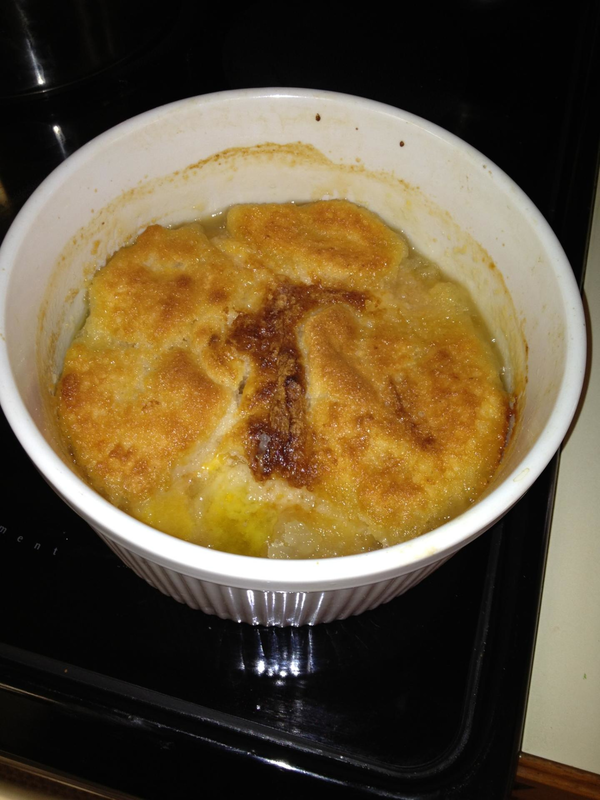 I have lovely photos of each of these recipes if anyone would like them. Just let me know! What a fabulous evening we had in Memphis on New Year’s Eve. It was a drizzly 45 degree evening when six couples gathered for an elegant “Downtown Abbey” experience in our home. 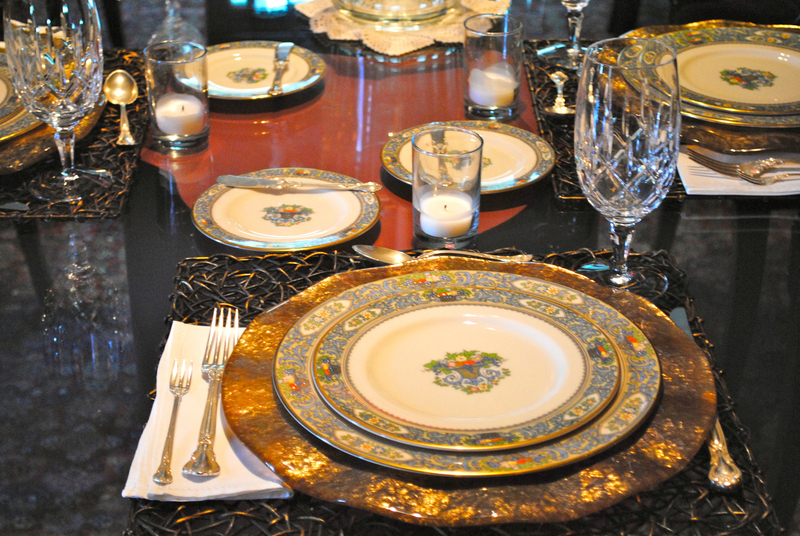 The table glowed in gold accenting the Lenox Holiday China and glass gold ruffle chargers. The beautiful gold Lenox placemats and napkins looked gorgeous. I decided on the Gorham Cherrywood crystal. The lighting in the dining room and our glass top dining table reflected the sparkle beautifully. We were delighted to be served by a professional waiter following cocktails and appetizers in front of the fire in our great room. After our lovely dinner, we indulged in various liquers and coffee plus a New Albany Chocolate birthday cake for one of the attendees whose birthday happens to be on New Year’s Eve. 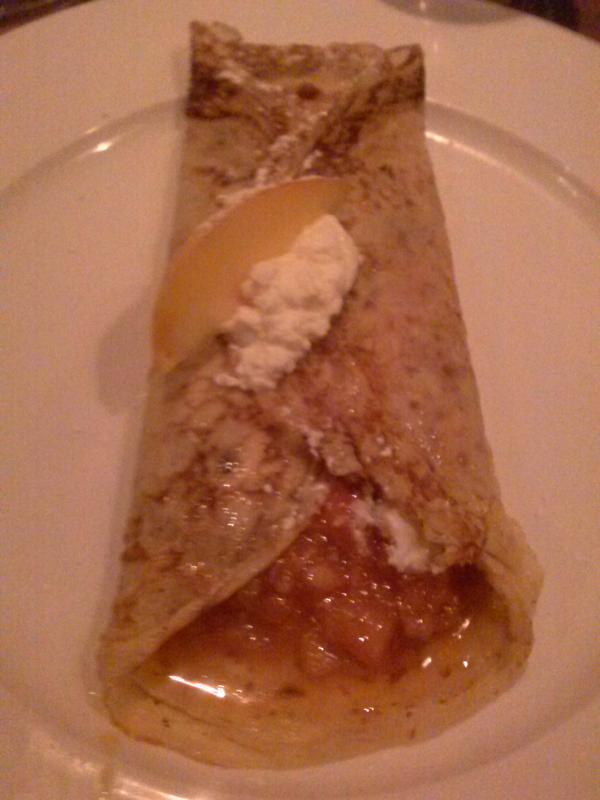 We also served Ina Garten’s creme brulee, which turned out perfect. Next, we took official NYE portraits of each couple in the chocolate chair in front of the fire. Next week I will send them their photo as a momento of our lovely evening. After donning party hats and grabbing kazoos, our guests then stepped outside through the piano room to the pool deck where we enjoyed sparklers and light fireworks following the “guitar drop” at Gibson’s. It was a bit chilly and damp so we enjoyed coffee, champagne and truffles inside by the fire before the party adjourned. I think we made some good memories. Thought you might enjoy reading our menu. Andrea Bocelli and Sarah Brightman sang softly in the background . . . Arriving in Chattanooga recently to speak at a #SHRMChattanooga luncheon meeting, we lucked upon a the cutest little diner I have ever seen. It was quite cold and damp and were in search of a comforting bowl of soup and a good glass of wine when we spotted a wonderful nostalgic neon sign flashing Welcome to@City Cafe Diner. What a charming and welcoming sign! Love neon signs – such a blast from the past! 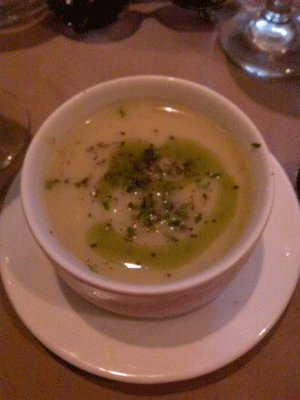 I was expecting a quaint little burger joint, which was fine as long as they had a warm bowl of vegetable beef soup. What a surprise to find a quite sophisticated menu and an in-house bakery that is the most fascinating I have seen in this decade. Imagine my delight to find Manhattan Clam Chowder on the menu in this little Southern diner. Fabulous cakes at City Cafe Diner. 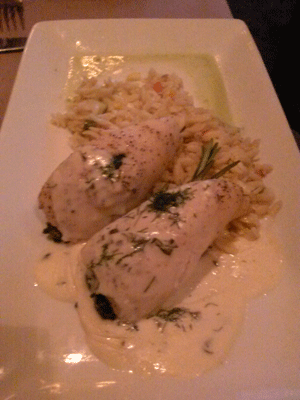 Not only did I love the chowder, but I also enjoyed the ambiance of this wonderful little Chattanooga surprise. How often do you find a Southern restaurant that serves Manhattan Clam Chowder? 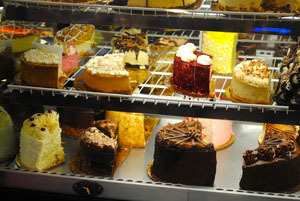 There is a full bakery showcase full of the most beautiful cakes and pastries I have ever seen. What a wonderful idea! 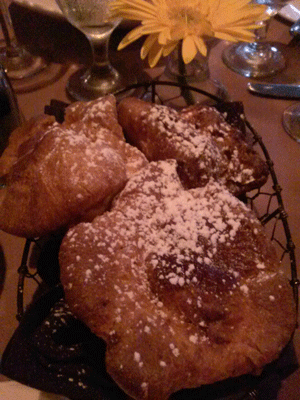 An excellent diner with a lovely bakery in house. The place is a visual delight complete with charming little red leather booths and soda fountain stools. We lingered there much longer than we should have and enjoyed watching all the locals pour in and taking it all the sights and sounds. I expected the “Fonz” to walk in any minute. 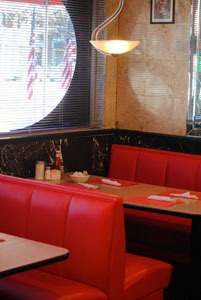 Charming red leather booths – a blast from the past. 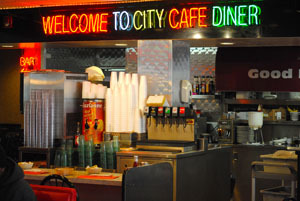 Can’t wait to go back to Chattanooga and visit the @CityCafeDiner again when I can stay longer. 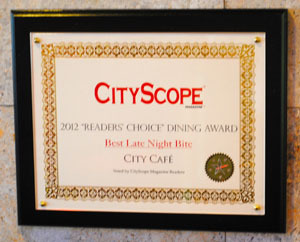 I was not surprised to see the City Scope Readers Choice Dining Award for Best Late Night Bite on the wall – well deserved! This is truly one of Chattanooga’s best kept secrets. You will find it at the corner of 901 Carter Street and M. L. King Blvd. Enjoy! On January 5, 2014, the long-awaited first episode of the 4th season of Downtown Abbey finally arrived on PBS. The excitement mounted as my husband and I relived the 3rd season episodes each Sunday evening – plus the previews of the coming season in anticipation of the new season. We began a new ritual of elegant dining in front of the fireplace using some of our favorite menus and recipes. However, we decided to do something extra special to celebrate the new season. 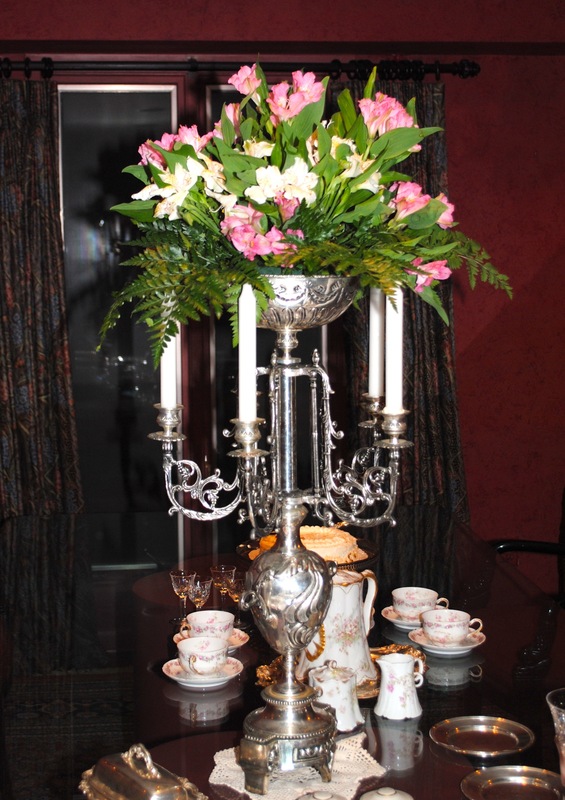 This antique silver centerpiece is always on my dining room table with seasonal flowers to match the occasion or the china service I am using. 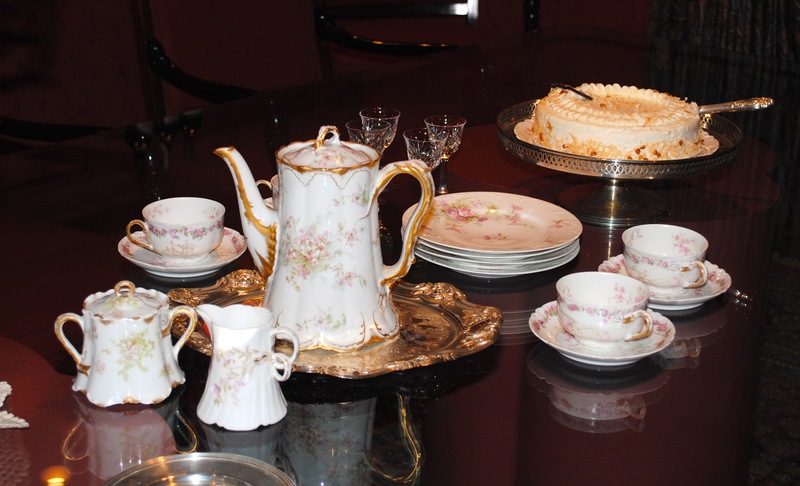 So we invited some fellow Downtown Abbey “groupies” over for an elegant dinner party using our French Limoges (Theodore Haviland), which my husband inherited from his grandmother. We seldom have an occasion that is appropriate to use it. What made the dinner party really special was the music we enjoyed during dinner. 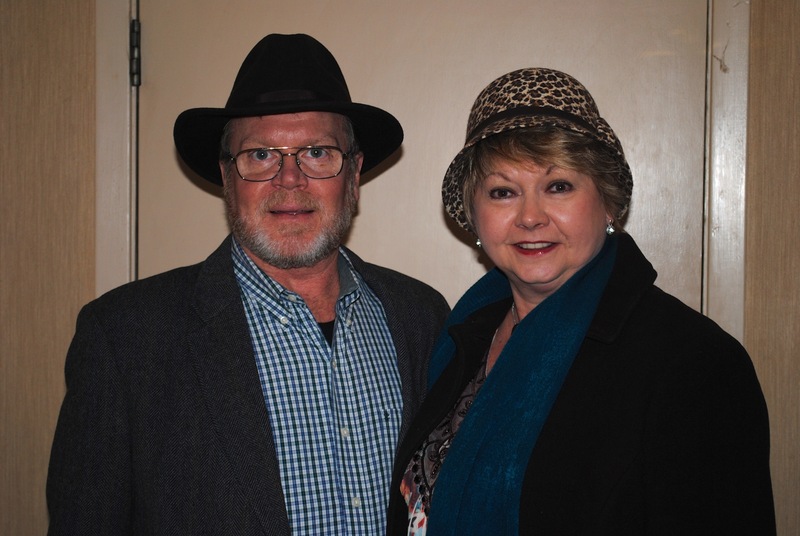 The Carmichaels brought the “Downtown Abbey CD,” the original music from the television series by John Lunn. 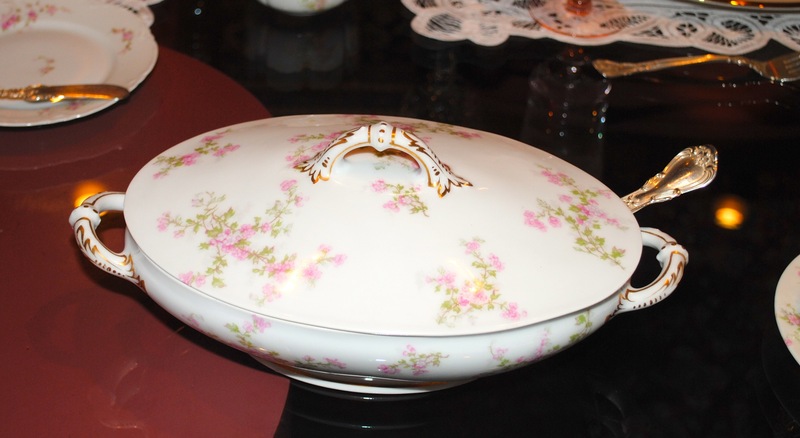 I highly recommend this lovely touch for your special Sunday night dinner if you are a fan. 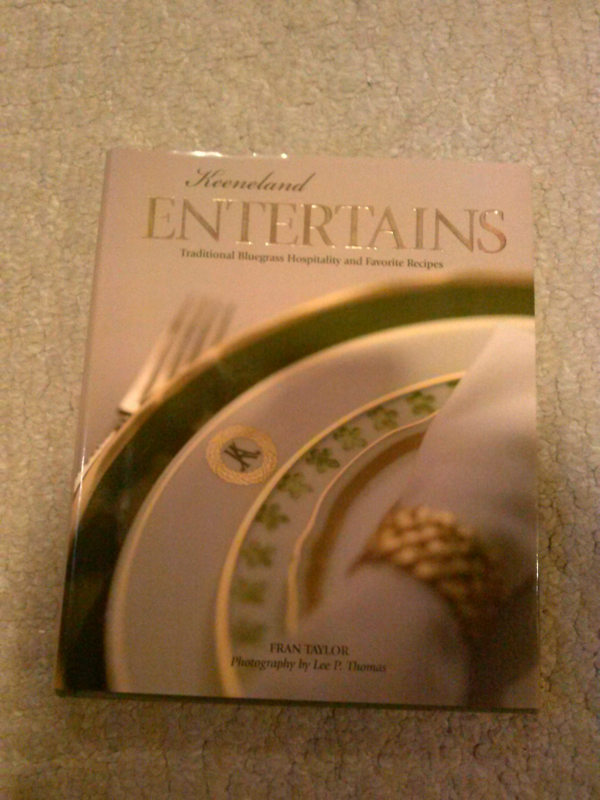 It will take your dinner party back to The Gilded Age. 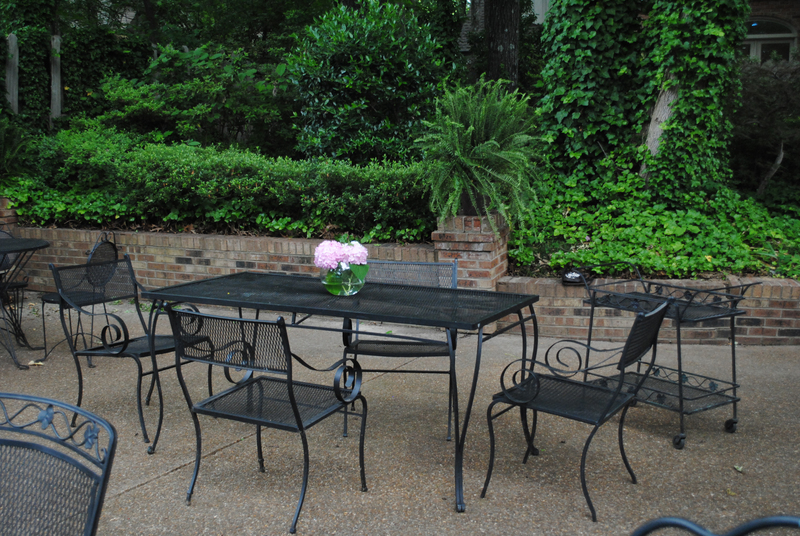 It was an unseasonably cold evening for Memphis and the perfect time for a cozy dinner party for four. I decided on an Italian theme for the menu because I wanted to serve Grisanti’s “Elfo Special.” If you are from Memphis, you know this is a special recipe! It appeared in the Commercial Appeal on January 11, 2011, and I was so thrilled to finally have it! It’s a luscious concoction of butter, garlic, shrimp, mushrooms, grated Romano cheese and thin spaghetti. I channeled Tessie Oelrichs, known as the The Gracious Hostess among the leaders of the Newport, RI, summer colony of The Gilded Age, as I cooked imagining her servants making this meal at Rosecliff for one of her elaborate dinner parties. 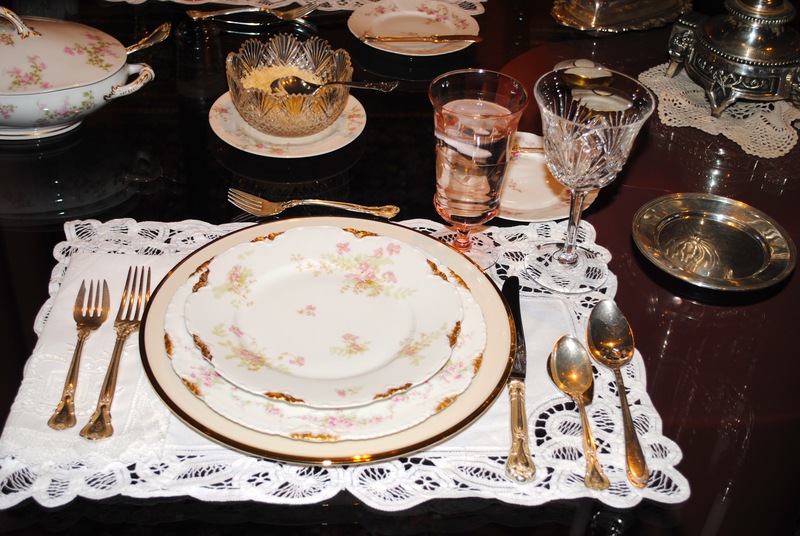 Place setting of Limoges with Chantilly silver by Gorham and Cherrywood crystal also by Gorham on Battenburg lace placemats. Here’s the entire menu for our special Downtown Abbey Dinner Party. 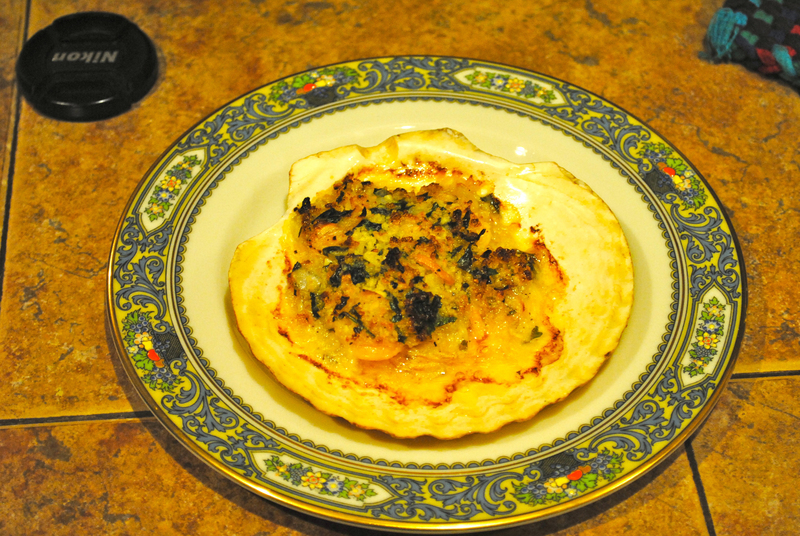 I love using the Limoges covered casserole for sauteed spinach. 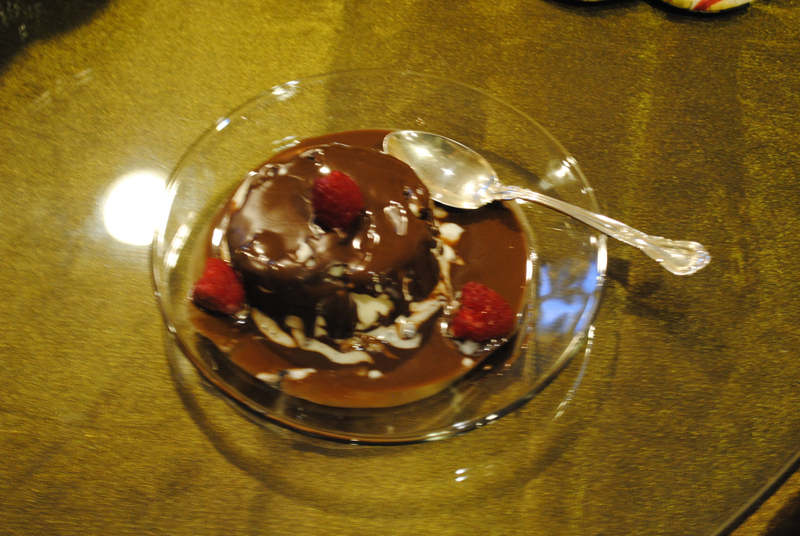 We started the evening in the great room in front of the fire and moved to our formal dining room for dinner ending up back in front of the fire for Italian Cream Cake, coffee and Prosecco for dessert. We made a special memory on this night and I bet there are others who did also. 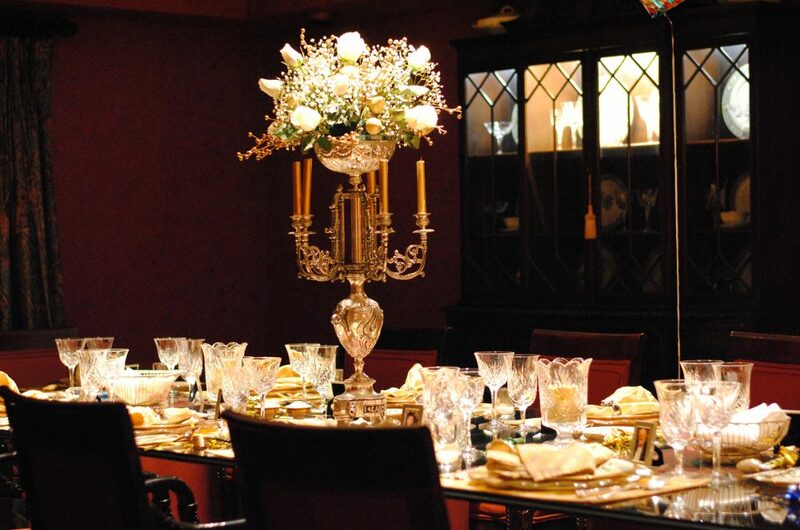 Did you have a special dinner party for the Downtown Abbey opening season show? If so, please share it with us!